Carl Frederik Aagaard (Born 1833) was born in Odense, Denmark. 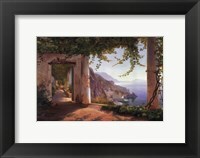 He’s known for his landscapes of tourist spots. He was first instructed in his native place but later became a pupil at Copenhagen Academy. Aagaard was taught and influenced by many leading artist but the one who had the strongest influence on him was his final teacher, Peter Kristian Skoovgaard who was a landscape oil painter. 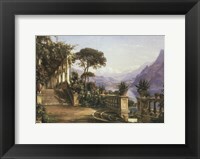 Aagaard continued to exhibit in several places and his trips to Italy and Switzerland helped to perfect his style of realism landscape oil painting with such works of art as Amalfi Di Cappuccini and Pergola in Amalfi. Copenhagen where Aagaard studied drawing was the center of a stunning rebirth of the arts. Such great individuals as philosopher Soren Kierkegaard and Hans Christian Andersen had come out of Copenhagen by the middle of the 19th century. Aagaard was no mean artist. In addition to studying drawing, he assisted his older brother at his professional studio where he was doing glass engraving. Aagaard then studied in Hilker’s studio. He collaborated with Hilker, an oil painter, on work at the University and other public buildings. Aagaard’s attention to detail was phenomenal. He simply painted to paint- no other reason. He truly had a pure passion for painting. It is therefore not a surprise that ready to hang framed Carl Frederik Aagaard art are very attractive and are found in nearly all corners of the world. Aagaard exhibited his oil paintings for the first time with great success in 1857. Aagaard died in Copenhagen aged 62.